Earn up to 26,000 reward points. A head that'll do everything you want, and a legendary cab to match. In a nutshell, the Marshall all-valve, 4-channel JVM410H 100W tube head is the most versatile Marshall amplifier ever made. 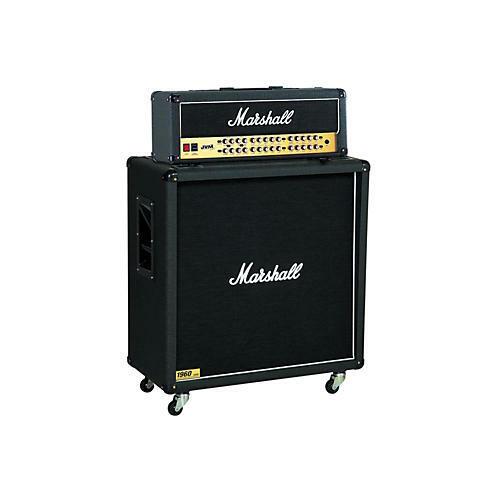 It also boasts more gain than any other Marshall guitar amp head to date-and that's really saying something. Each of its 4 channels-Clean, Crunch, OD1 & OD2-are not only completely independent of each other, they all boast 3 modes, all 12 of which are footswitchable and feature their own unique gain structure. It makes the JVM 4-channel effectively 12 Marshalls in one. The JVM410H amp head has studio-quality digital reverb with a level control for each channel. This is also footswitchable, as are the amp's 2 Master Volume controls and the Series/Parallel effects loop. Resonance and Presence are equipped with master controls. Even though the head and combo both house 28 controls and 8 LED switches on their front panels, they're incredibly simple to understand because of the extremely logical layout. Each of the 4 channels has the usual suspects when it comes to control-Volume, Bass, Middle, Treble & Gain-accounting for 20 of the 28 controls right away. Take away the four reverb controls and you're only left with 4 Master controls-2 Master Volumes plus Resonance & Presence. Add to this an ingenious footswitch (UK patent pending) and the fact all the amplifier's switching (channel/modes, Reverb, Master Volume selection, FX loop) can be done via MIDI and you're looking at an incredibly flexible amp! The 6-way footswitch boasts 7 LEDs and memory, plus it connects to the amp via a regular guitar cable. From the cleanest clean to the filthiest distortion ever found in a Marshall and all points in-between, the JVM410H all-valve guitar amp head will give you whatever tone you need right when you need it. The 1960B cabinet has a straight front. This means that all four speakers face out in the same direction, which gives the 300 Watt 1960B a more focused sound. Because the 1960B isn't angled, it has a larger cabinet which has a lower resonant frequency. The effect of this is that the 1960B produces a slightly thicker sound. Dimensions: 29.5" x 12.2" x 8.5"
Dimensions: 30.3" x 29.7" x 14.3"